Collaborative desk makers are definitely having fun designing new shapes to better allow 21st century students to work in pods and then again, individually. Balt’s latest design concept, Cloud 9, rounds out this week’s new product spotlight. 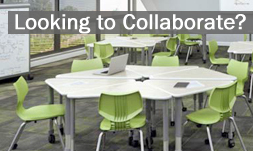 There are two product styles available in the Cloud 9 series: the collaborative desk, and the collaborative station. The Cloud 9 desk is smaller and is designed for single student use, with the ability to create endless group configurations. The unique shape creates three separate orbs, if you will, so that the student has a place for writing notes, a place in front for a tablet or laptop, and a another side space for books and other reference materials. The Cloud 9 station is larger and is available in two sizes to best suit your classroom size and purpose. Stations are designed to allow multiple students , up to 3, to sit at one table for group discussions and small PBL activities. These larger sized tables can also be used outside of the traditional classroom and are finding their ways into business training areas and forward thinking office conference rooms. The Cloud 9 Desk system is the perfect configurable classroom desk system with full right handed and left hand accessibility. A person can pull up a chair and have 3 directions they may face. This is a perfect design for STEM or STEAM classrooms that rotate their attention to multiple zones within a single classroom throughout the day. Moving a chair is a lot simpler than moving both a chair and a desk. Like other classroom desks, the Cloud 9 desks feature scratch resistant high pressure laminate tops with ABS edge banding. Standard laminates with faster lead-times range from Cherry, Maple, Oak, Gray Nebula, Gray Mesh, Nepal Teak, Graphite Nebula and Pewter Mesh. Custom Wilson Art laminates are available on any desk for an upcharge and slightly extended lead-time. Just contact their dealer, Worthington Direct, for pricing and to place your order for fun colors like orange, purple or white dry erase marker top. Cloud 9 desks and stations are height adjustable from 22″ to 32″ high, which make them suitable from elementary students through university and beyond. Legs are powder coated in Black or Platinum and are designed for quick assembly. Glides are standard, but casters are available and recommended to make configuration transitions easier. Other accessories include wire book boxes and backpack hooks for the storage of classroom materials and personal items. Having backpack hooks may not seem like an important feature, but when you consider the alternative of 30 backpacks lying in aisles, it can really make the difference in a spacially challenged classroom. Balt has expanded their classroom desk options, so if the Cloud 9 is not the right fit for you, check out some of their other designs like the Chevron, Shapes, Quad or Snap Desk line. If you want to add some height variation to your classroom or office, consider Balt’s stand-up desk, the Up-Rite. How do I find a cost list?